Dang-là Vu: The Return of the East End Dangler! 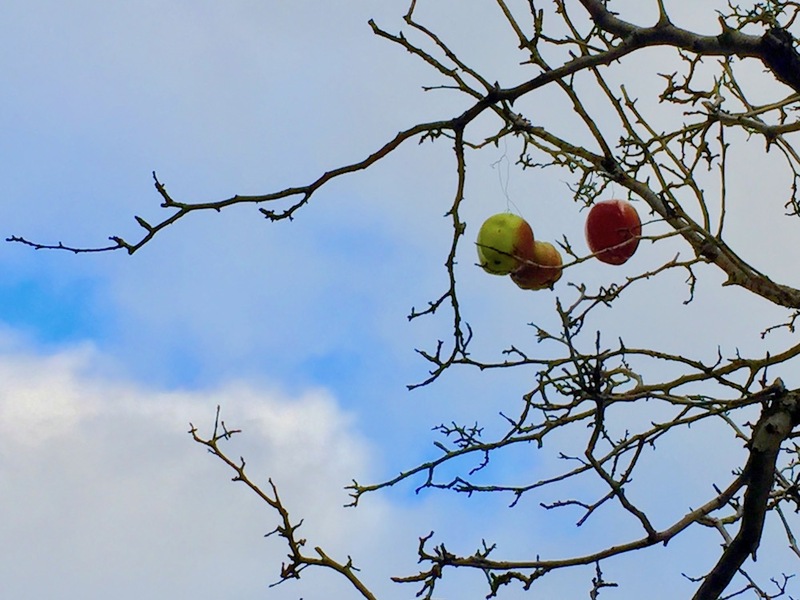 ripe (looking) apples hanging from bare tree limbs–The East End Dangler has returned! Things had gone quiet on Centre Avenue. Spring turned to summer, and then summer rolled over to autumn with nary a bustle in our hedgerow. It was enough to make the few who experienced it believe the whole thing had been a strange dream. Cue: soft focus and shimmering harp glissando. A line of fish, each one tied to the next by a length of twine knotted around their tail fins. 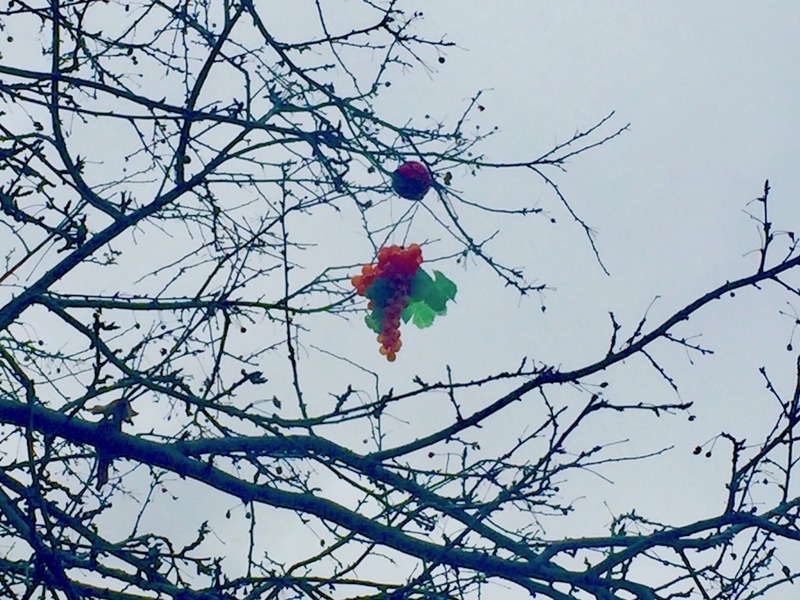 The little garlands, suspended from branches of mid-sized street trees, gently swaying in the breeze like decorations for a strange holiday. Did that really happen? Oh yes, it was for real–and serious as a heart attack. Even more, after an apparent six- to ten-month dormancy, this dang-là vu is happening all over again. The East End Dangler is back–and this time, he or she isn’t fooling around*. The Dangler has a ready supply of small children’s toys and decorative plastic fruit. The Dangler regularly traffics on upper Centre Avenue in East Liberty (nearish Whole Foods). The Dangler loves all-you-can-eat Asian seafood buffets. 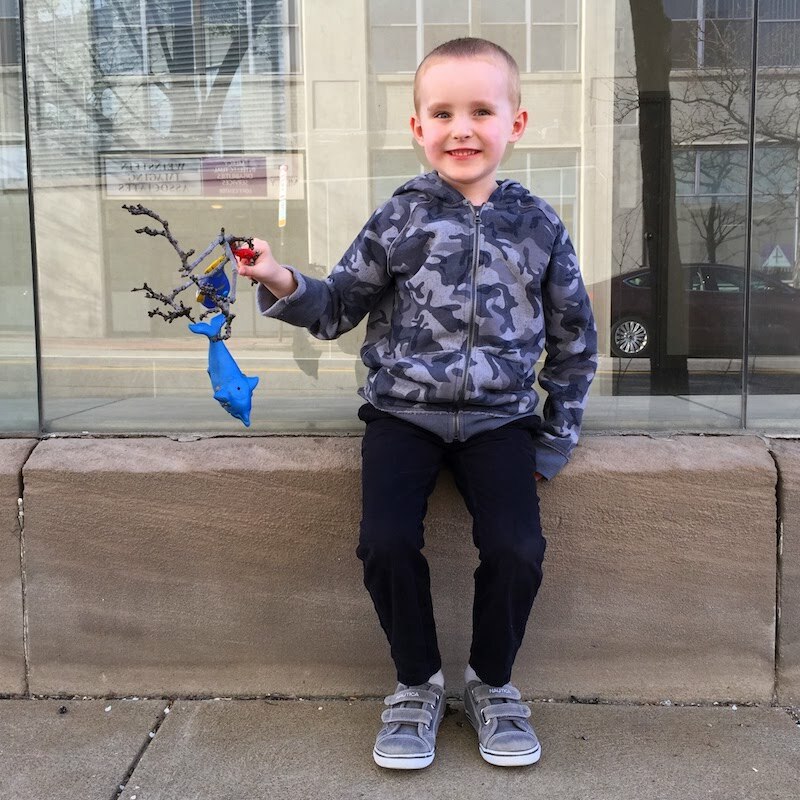 To catch you up: starting in 2017, Orbit staff began to notice strands of toys hanging from the limbs of street trees in East Liberty. What first felt like a one-off goofy prank soon revealed itself as full-on, serial hanging-around. We’ll not rehash the whole series of events here, but that initial story unwound in “Something Fishy: Angling for the East End Dangler” [Pittsburgh Orbit, May 13, 2018]. As mentioned in the intro, a quiet period followed this initial rush of dangling–too quiet, as the cliché goes. Indeed, after some period of months Orbit beat reporters spotted brand new dangles in the same approximate locations starting up in the late fall. In an attempt to smoke out the assailant, the crew settled in for that most grueling part of detective work: the stake out. Between the salt-and-pepper squid and wood ear mushrooms, “crazy roll” sushi and cheese wontons, kielbasa and garlic bread, all eyes were trained on the handful of trees just above Hokkaido Seafood Buffet’s parking lot on Browns Hill Road. Why, assuming we weren’t up re-loading another platter of pork shumai and seaweed salad, cotton candy ice cream and banana pudding, the focus was unrelenting. But–unlike the case of heartburn that hit a little later that afternoon–The Dangler didn’t show. 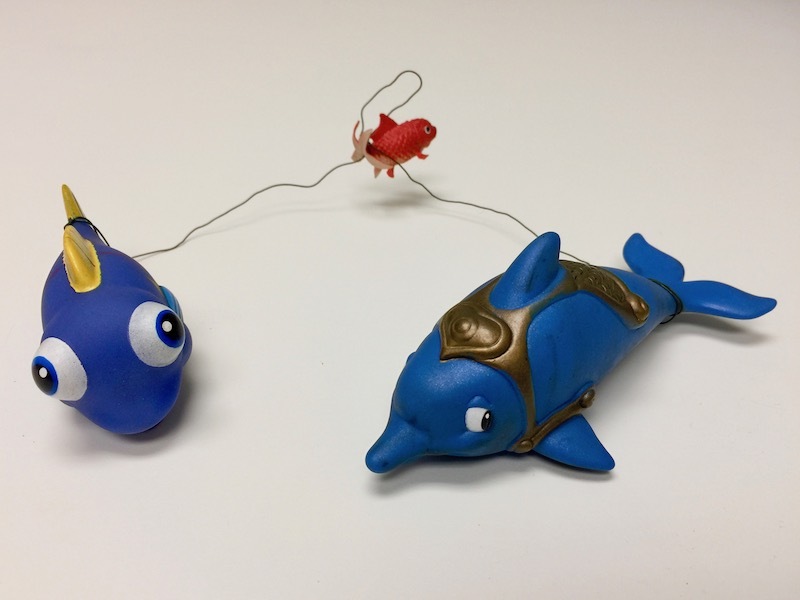 We do see some new media this time around–The Dangler has moved on from a strict palette of Happy Meal toys and rubber fish to now including decorative plastic fruit. All other signatures are entirely consistent. Not content to just sit on our collective keister while a mad prankster was stringing up their next trophies, we decided to send The Dangler a little message. Borrowing from our own arsenal of cast-off Hot Wheels and sandbox-encrusted earth movers, co-assistant to the mailroom intern Lee baited the hook by assembling his own strings of pearls. 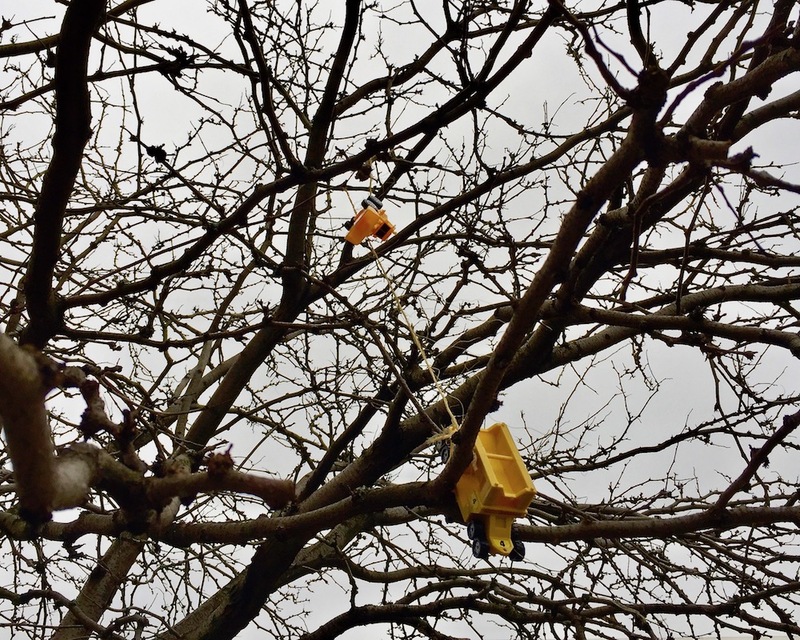 These were taken to the same general batch of street trees along high Centre Ave. and placed for maximum effect to catch The Dangler’s attention. Now, we know correlation is not causation, but let’s just say we set a trap…and The Dangler stepped in it. Sure enough, the ol’ tree stringer came a-runnin’ as if mom or dad had served up supper in the sycamores of Danglerville. Or, at least, the R.S.V.P. 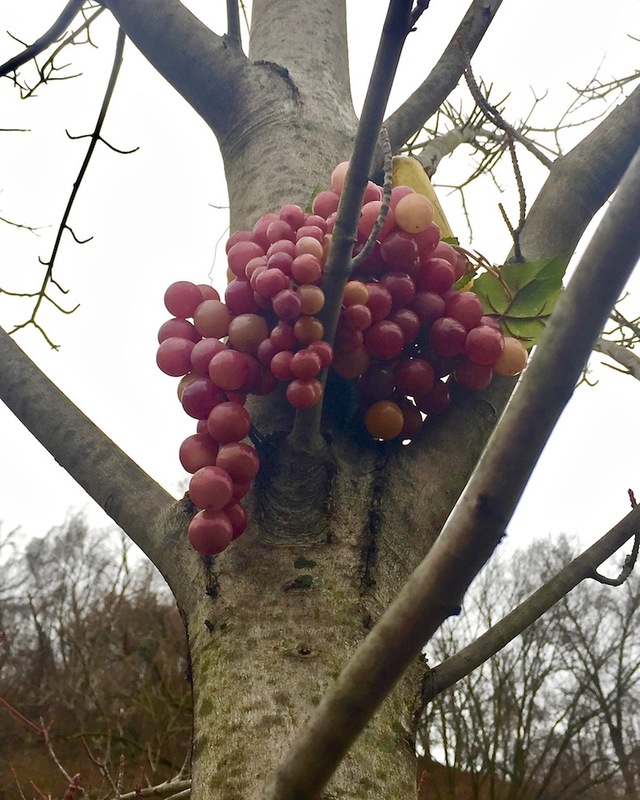 we mailed out on a whim was answered with a bouquet of plastic grapes hung high in the branches at Centre & South Euclid. 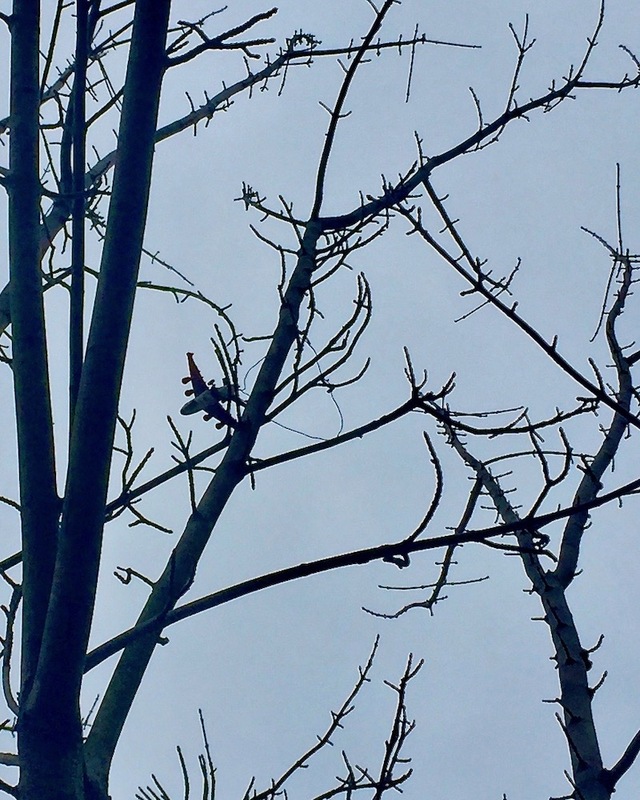 The Dangler also went on to bomb several more trees in the same pair of previous locations. Our serve was returned with a volley that could only be read as a challenge. Well played, Dangler. Just as it’s naive to assume our solar system is the only one in the universe sustaining life, we should sooner hand over our quasi-journalistic credentials than think we’ve cornered every possible dangle. No, Pittsburgh is a big city–at least, in terms of square miles and tree coverage–the idea that unassisted Orbit staff would have just randomly tripped across the only two locations of serial dangling would be foolish. The Dangler must have struck elsewhere, right? That seems not only plausible, but a sure thing. 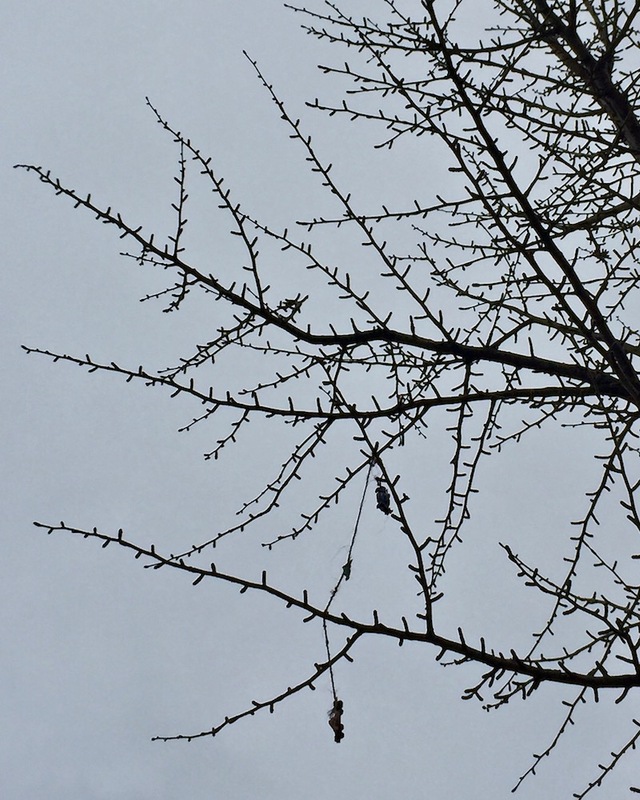 However, if true, the dangles remain in tree limbs so far un-spotted. Carnegie Music Hall’s Shakespeare statue with appended apple–the work of The Dangler? That may have changed with one additional clue at the beginning of this month. 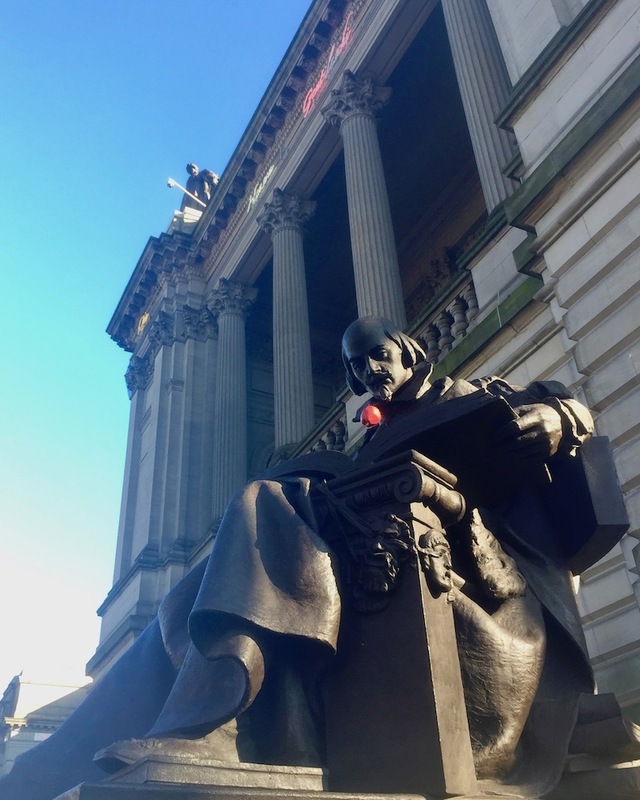 The statue of William Shakespeare in front of the combined Carnegie Music Hall/Library in Oakland was updated to include a single red plastic apple, hanging from The Bard’s neck. It is absolutely not The Dangler’s style to suspend single objects from public statuary. And yet, there are enough obvious similarities here to send us into a certified tizzy. Is this the work of a brazen copycat? Coincidental pranksterism? Or has The Dangler decided to taunt his victims in an obvious act to goad us into making an impulsive mistake? Pittsburgh Orbit cannot answer these questions…yet. But Dangler, if you’re reading this, know that we’re onto you like a strand of fish in a street gingko. We’re putting the pieces together and we’ll not rest until your dangling ways are understood. If you have any additional information on The East End Dangler or other dangled targets, please contact our anonymous tip line. We need all the help we can get on this important case. * Actually, he or she probably is fooling around. It started, as these things do, with just a single incident. Back in the early fall, out on an afternoon constitutional, the crew came across a curious sight. 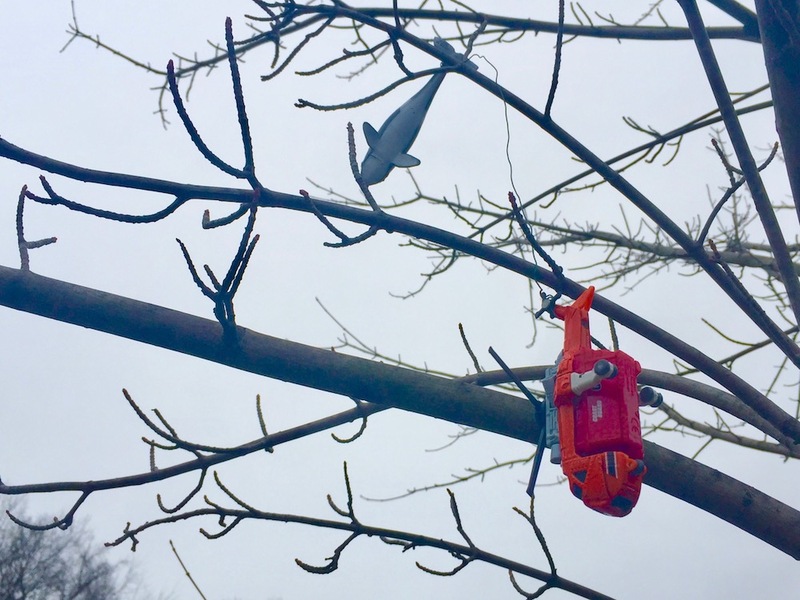 Tangled in the mid-level branches of a street tree on Centre Avenue was a six-inch plastic tiger shark, hanging by a length of rough twine tied around her tail fin. 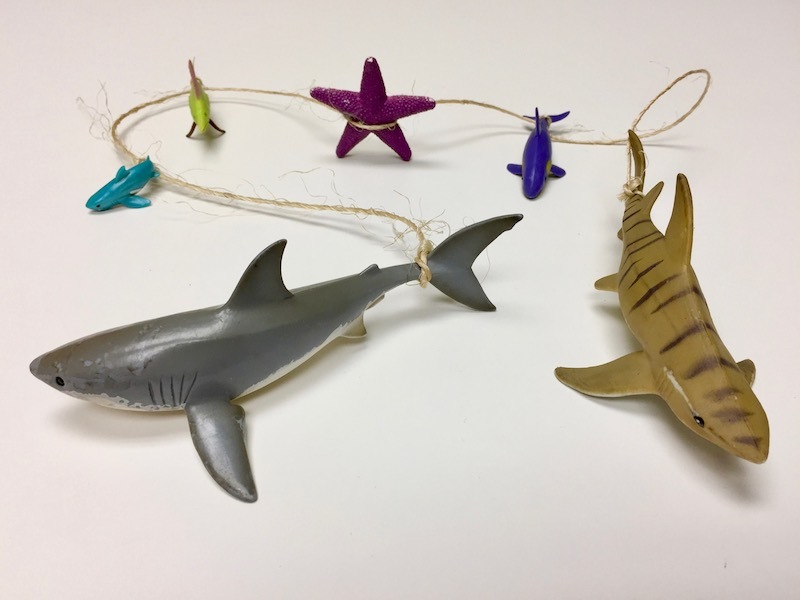 Following the string led to a purple dolphin, then a starfish, and so forth. Six miniature sea creatures in all, very much out of water, and awkwardly tossed into the leafy undergrowth just above head level. As we’ve mentioned before, Orbit staff maintain a strict do-not-disturb policy when it comes to street art, pranks, and other happenstance findings in the public sphere. Our interns do not always abide by the same code of conduct. Such was the case on this day, as cub reporter Lee extracted the string of toys from the overhead branches and brought it back home for further examination. While that felt very much like disturbing the scene of a crime way back in September, it would prove eerily prescient. It was only just recently that we became aware this was no isolated incident. That’s right: Pittsburgh has a repeat offender on a loose and he, she, or they have struck enough times to warrant serial status. 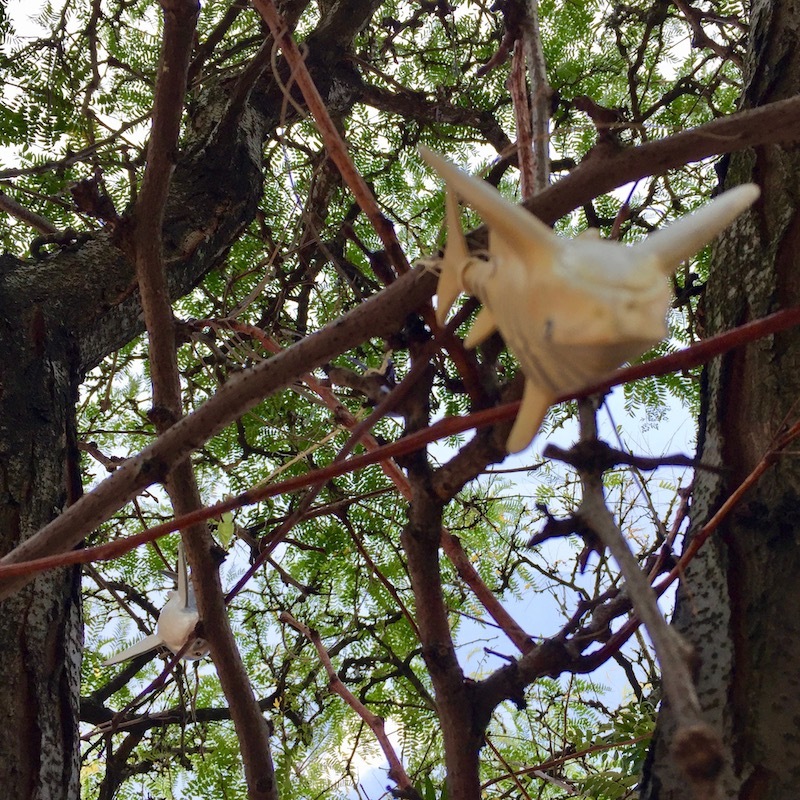 The East End Dangler walks among us, covertly decorating the city’s flora with strange garlands of (mostly) plastic fish. Nearly seven months after that initial encounter, we were certainly in for a surprise. Walking back to the office on a chilly early spring afternoon–the belly still reeling from a lunch of huevos con chorizo con tortillas con frijoles con arroz y unlimited chips–to see a tiny die-cast aeroplane poking its propeller schnoz out of the newly-cut grass. 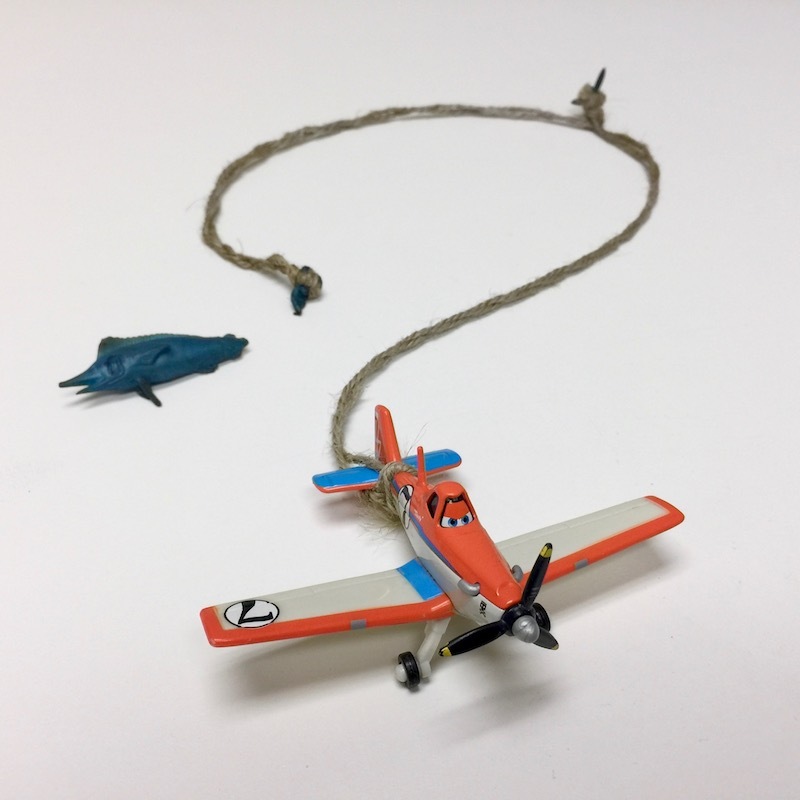 On retrieval, we found the same tell-tale twine knotted around the plane’s tiny tail and rudder. It wasn’t until just this moment that the connection between aircraft design and sea life anatomy became so perfectly clear–but let’s stay on topic. 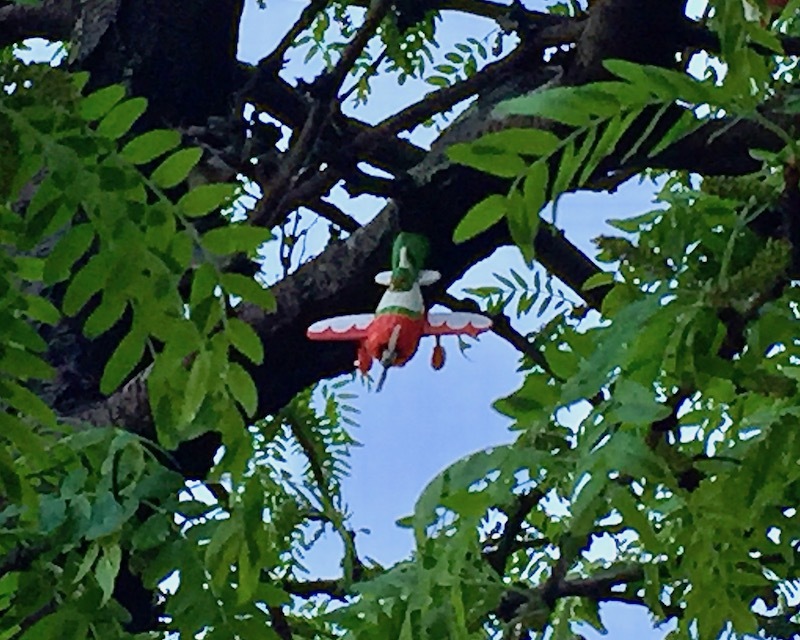 Our very same cub reporter not only identified the toy as “Dusty Crophopper” from Disney’s Planes but also spotted a tiny rubber fish nearby. The squishy little fellow was dislodged from the strand when its tail broke off, but in an unlikely and gruesome turn of events, the dismembered body part was still caught in the twine to confirm the relationship. The revelation that the string of sharks was not a one-time deal would have–should have–been enough, but we were in for a couple more shocks. Mere feet away–O.K., maybe one or two hundred of them–was another bare tree with another set of dangling fish. In this case, two bug-eyed, cartoonish blue fish and one tiny red-orange fellow. Unlike the previous two marks of The Dangler, this trio was connected by wire (not twine) and thrown way up high, out of arm’s reach, but well within eyesight. Attentive readers are already yelling at their mobile devices, hopefully not in public restrooms. How did you jump from exhibit #1 to exhibits #3 and #4? What kind of amateur-hour investigation are your running around here? Ah–that’s where the plot thickens! Lee had already bagged exhibit #2 (aka “orange fish”) and just never filed his paperwork. Way out of the relatively-small perimeter we were working, this yang to “blue fish’s” yin [three fish, the little one in the middle, single color scheme, wire connector–orange and blue are even opposites on the color wheel!] hung from a tree along Browns Hill Road, miles from Centre Avenue. Like Ed Gein and Ted Kaczynski, Rudy Giuliani and Pauly Shore, we may never know what motivates The East End Dangler to do what they do. 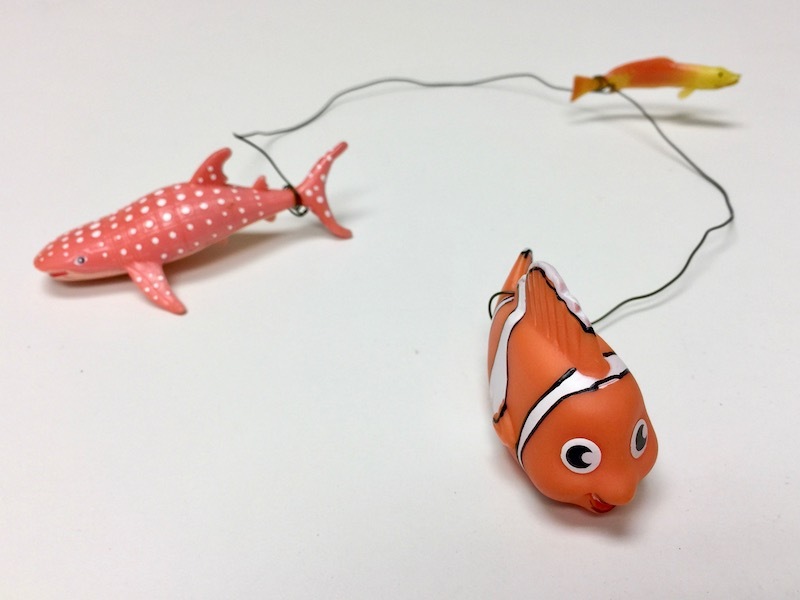 In lieu of any hard evidence on the person behind the dangling, we’re left with just the physical items: toys–specifically fish toys–and location. On that first point, one popular theory holds that the perp is a parent, the child or children having aged out of their fish phase and into teenage alienation. 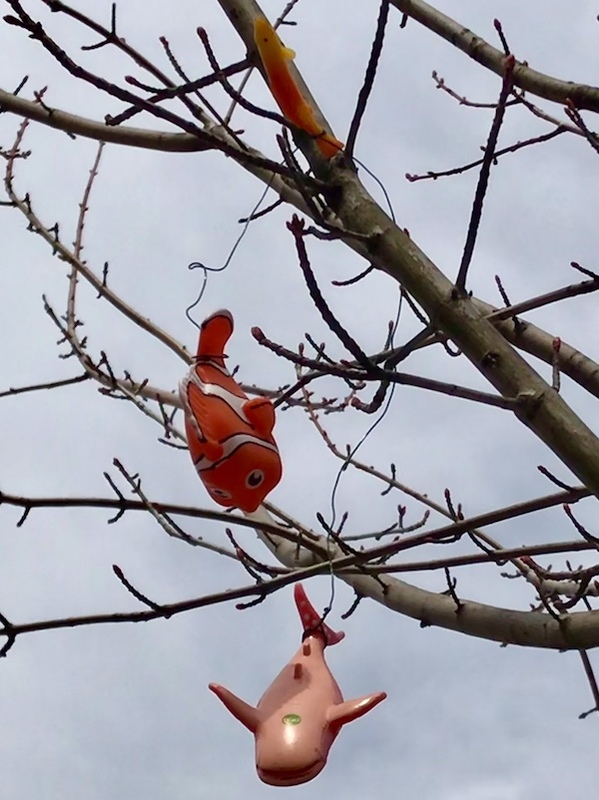 What to do with those leftover sharks, goldfish, and neon tetras but string them up and throw them in city trees? A little goofy, but more unlikely events happen around us every day. These may also be the work of a prankster or frustrated conceptual artist. The nearby Goodwill on Centre likely offers an ample supply of second-hand toys at by-the-pound prices. If decorating trees with Happy Meal castoffs is your thing, it can be done easily and at bargain rates. As art? Well, it beats spray paint tagging. A third opinion holds that we’ve got deeper symbolism here–something very specifically fish-related. All three of the Centre Ave. finds are within rock-tossing distance of the East Liberty Whole Foods; “orange fish” was spotted adjacent to the Hokkaido Seafood Buffet restaurant. It doesn’t take Hercule Poirot to connect these particular dots. Whether the Dangler might be addressing mercury in the food chain or the Pacific Ocean’s plastic vortex is unclear, but lines can certainly be drawn. We may never know…or this may just be the beginning of the conversation. 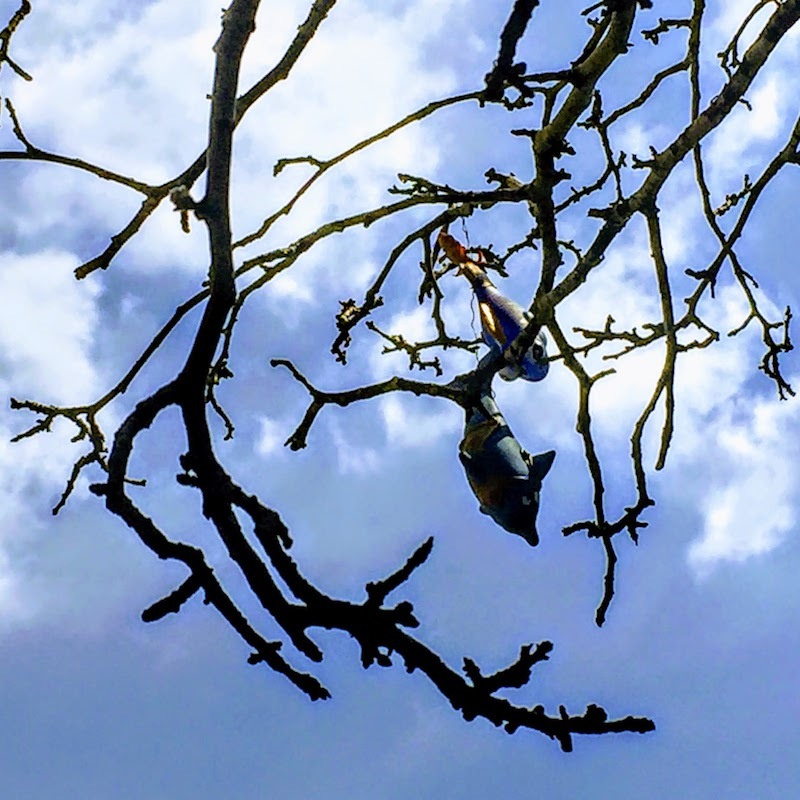 If you’ve noticed the work of The East End Dangler (literally) hanging around a tree you frequent, please let us know. Until then, to paraphrase Casey Kasem, keep your feet on the ground, and keep reaching for the fish in the trees. BREAKING NEWS: On the eve of going to press, The Dangler dropped another bombshell on us. There, in those same Centre Avenue street trees hangs yet another dangled concoction. This one appears to be just two toy airplanes, one a bulbous, cartoonish propeller; the other, a second Dusty Crophopper. As of this writing, the dangled bits remain tree-side.